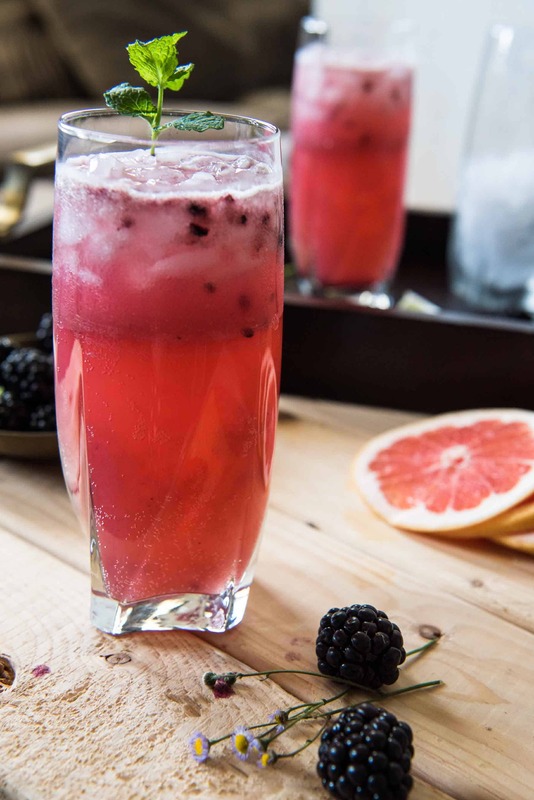 The Blackberry Paloma cocktail is a berry delicious take on an already twisted cocktail! 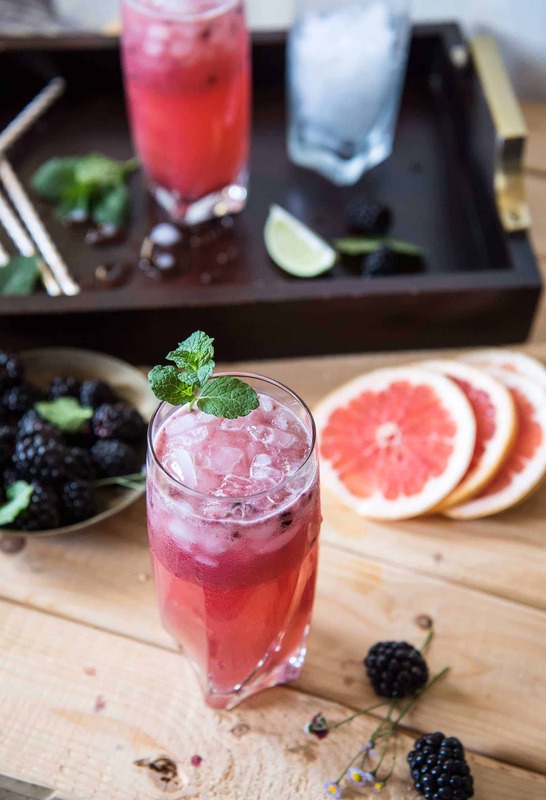 Muddle grapefruit juice and blackberries together with a little tequila, mint, and sugar, and you’ve got yourself a lovely version of the popular Mexican drink. Today has been a stellar day. Yesterday was bittersweet, but today – completely wonderful. It brought me a glimmer of clarity and peace that I never thought I’d know. I can’t think of a better way to celebrate a new job – a new lease on life – than with a delicious little cocktail that’s perfect for Cinco de Mayo, can you? JUST TAKE ME TO THE PALOMA COCKTAIL ALREADY! 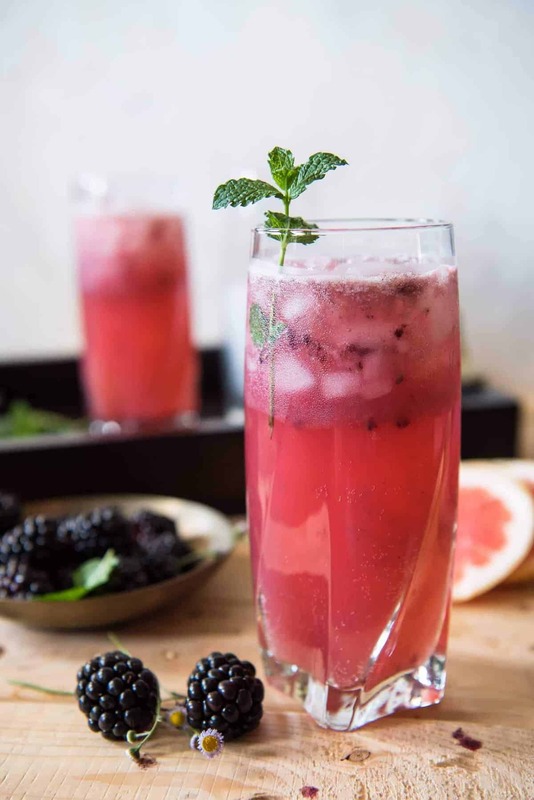 If you’d rather skip my (pretty darn helpful) tips and tricks, essential cooking info, and similar recipe ideas – and get straight to this deliciously easy Blackberry Paloma Cocktail recipe, just scroll right on down to the bottom of the page where you can find the printable recipe card! I won’t wax poetic about career changes, but I highly recommend them. Especially if you’re mostly miserable where you are. Excuse my Millennial, but in spite of hating the shorthanded, hipster phrasing, I am a firm believer in YOLO. For the last three weeks, I’ve been explaining my decision to leave my career of 17 years for a relatively uncertain future, but I haven’t needed to. Long story short, if I don’t leave now and do something that makes me happy…I never will. And since I’m so highly supported and encouraged by my husband and loved ones, it didn’t seem fair to myself to not take the chance. I’ve jumped feet-first into a fast moving train of a job, but I think I’ve found the seatbelt. Now if someone would pass me a Blackberry Paloma to enjoy the ride with, I think I’ll be set! So, Palomas. What are they? Think of a margarita, but you toss in some deliciously tart grapefruit juice. That’s basically it. 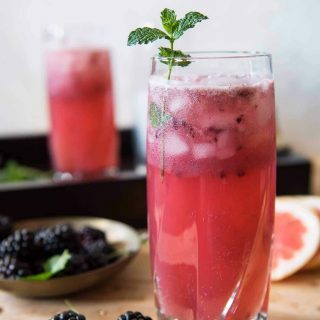 It’s a lovely cocktail, and this one is made even lovelier with the use of fresh blackberries and bright mint to balance out the bitter citrus. It’s gonna be a delicious addition to your Cinco de Mayo menu, too. And beyond! What’s in a Paloma Cocktail? A simple, standard paloma is made up of tequila, lime juice, sugar, and then a fizzy grapefruit juice – either soda or juice + sparkling water. 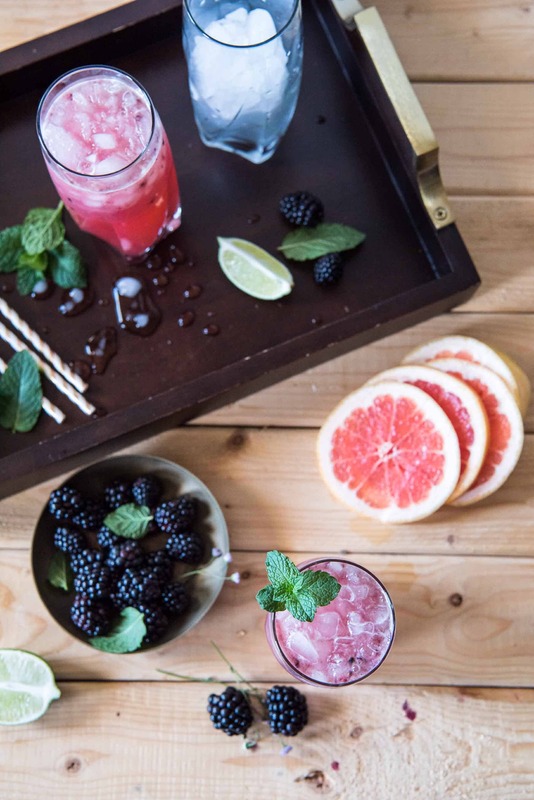 In THIS paloma, you’ll find all of that PLUS muddled blackberries & mint. To start, squeeze a lime wedge into a cocktail jigger, or in the bottom of a glass if you’re without one. Add the blackberries, mint, and lime wedge and muddle together. Next, add grapefruit juice, tequila, and simple syrup (or sugar). Shake or stir until well mixed. Fill a glass to the top with ice, pour the cocktail in, and top with sparkling water. The Blackberry Paloma is a berry delicious take on an already twisted cocktail! 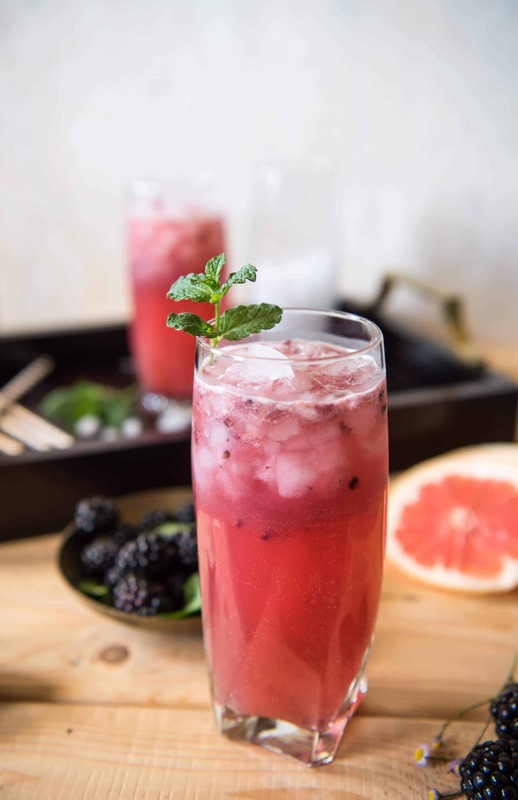 Muddle grapefruit juice and blackberries together with a little tequila, mint, and sugar, and you've got yourself a lovely version of the popular Mexican drink. In a cocktail jigger, squeeze the juice from the lime wedge. 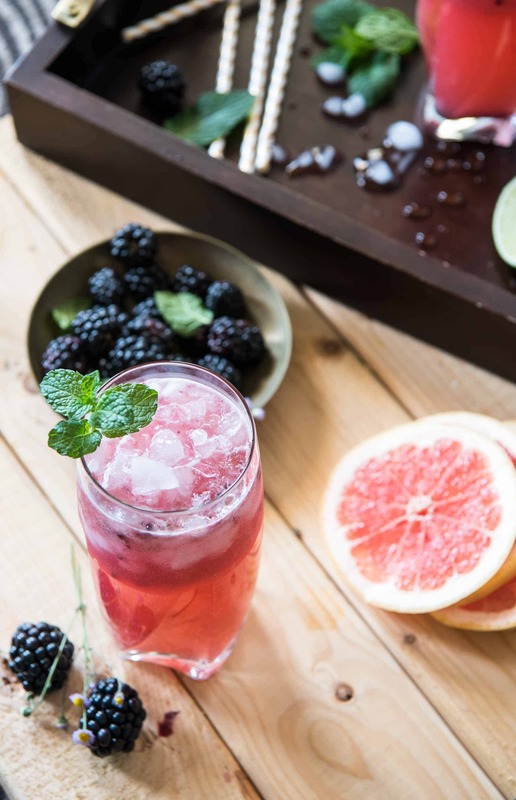 Gently muddle the blackberries, mint, and squeezed lime wedge together. Add the grapefruit juice, tequila, and simple syrup. Shake until well mixed. Pour over a tall glass filled with ice and top up with sparkling water. Garnish with mint as desired. Are you ready for Cinco de Mayo? The Sunday Supper Tastemakers can help with these 25+ recipes de perfection! This looks and sounds so bright and happy and refreshing! I also LOVE your attitude. You have to fight to be happy or what are we doing here. Someone told me a bad day fighting for your dreams isn’t really that bad. That’s true. There will still be bad days, but they will be worth it. This looks super refreshing and I love the color! LOVE this cocktail recipe!!! I have some gorgeous grapefruits in my fridge and I’ve been wanting to try to make a paloma. What a beautiful beverage! And I do have all of those ingredients at home right now. My husband is a huge fan of blackberries and grapefruit so this is a must try soon. Thanks for the inspiration! A nice refreshing summer drink. Good luck to you on your new career! You are right, if you don’t do it now you never will. I love the idea of this cocktail. Not only is it beautiful but I love a new tequila recipe! Congrats on the job change and taking the leap. This beautiful drink is the perfect way to celebrate! I don’t think there are words for how excited I am about trying this recipe. I’ve been a bit nervous about making Palomas because I was worried they’d be too sour, but I bet the blackberries even it out beautifully. Good luck on your new job! Cheers to a long happy future there! I was nervous too, and I LOVE grapefruit! Honestly, I think I got the ratio just right – it’s slightly bitter, but the tequila & berries definitely mellow it out. Let me know what you think, and thank you! this looks delicious! Dumb question, but what can I swap for the alcohol since I can’t drink? Not dumb at all! I actually made these virgin by mistake at first (who forgets the liquor in a cocktail shaker??) so you can just add a bit more grapefruit or sparkling water/club soda to fill ‘er up – whichever you like better! Cheers, girl! This looks so good, I love the blackberry twist. And so glad you had a fantastic time with friends to celebrate your transition – onwards with new things! Beautiful and refreshing! So perfect for Cinco de Mayo and any other reason to celebrate! Such a gorgeous and refreshing drink! I love your styling.